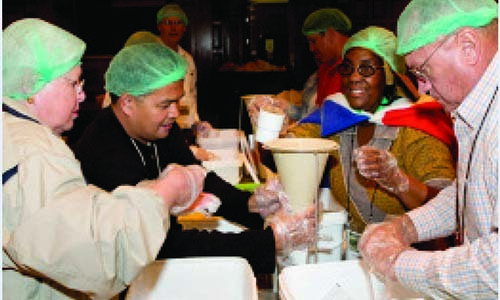 “I AM AN AMBASSADOR!” Congregants consisting of clergy and laity at the Aldersgate Service 2011 were encouraged by the speaker, the Rev Dr Eddie Fox, to say this phrase to each other, and they complied with much convivial laughter. 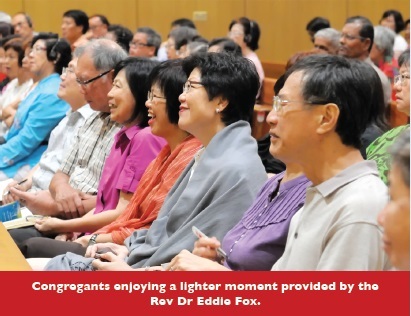 Being ambassadors of God was the main theme throughout his sermon, which was engaging in style as he often encouraged responses from the congregation and at times even attempted to learn Mandarin phrases from the Rev Dr Niam Kai Huey who provided the Mandarin interpretation. With the theme “Go and Tell: Proclaiming the Gospel Today”, the Aldersgate Service 2011 at Toa Payoh Methodist Church on May 22 got oﬀ to a rousing start with a musical introduction by the Wesley Soli Deo Gloria Orchestra, featuring several brass instruments, and the Wesley Combined Choir. is was closely followed by several processional hymns and choruses that were well-known to the congregation. A new hymn, “Change My Heart”, written by Bishop Dr Robert Solomon and set to contemporary music by musician-composer Jusuf Kamadjaja was sung in preparation for the sermon. 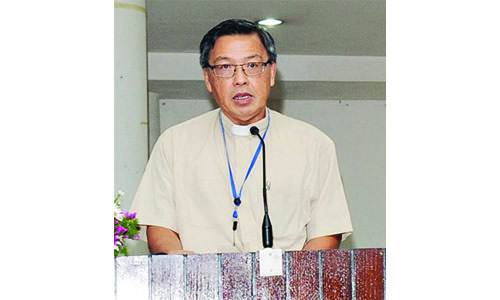 The Bishop then introduced the speaker, the World Evangelism Director of the World Methodist Council, whom he referred to as “the best-known Methodist evangelist preacher”, and who is an eighth-generation Methodist. The Rev Dr Fox began by speaking from 2 Cor. 5:17-20 to highlight our role as God’s ambassadors, pointing out that the role is not restricted to pastors but encompasses lay persons as well. He first established that “Missions is God’s idea”, explaining how God as a “seeking God” sought us first, and then as a “sending God” sent His messengers to us. God comes to us and reveals Himself to us in Christ Jesus, “God incarnate”, providing us grace that makes possible our response of faith, and truth that sets us free. is, stated the speaker, is why “Methodism is a missionary movement”. He then asked the congregation if they would be ambassadors for Christ as called and sent by God. He noted that Methodists are often unwilling to do so, joking that the reluctant prophet Jonah “must have been a Methodist”, to laughter from the congregation. He also highlighted that God does not prefer one people over another, but “wants the whole world to know the living God”. He urged us to be “faithful ambassadors of God’s eternal kingdom that will last forever”. “We are called to communicate His message and be faithful to His Word. We are to be ambassadors by our words, deeds and signs and wonders of the Holy Spirit. This stirring sermon was followed by prayers of response, and an upbeat oﬀertory song “God Is In e House”. The Bishop then made some concluding remarks, exhorting Singaporean Methodists not to see evangelism as just a programme, but to be ambassadors who “live evangelism” in their daily lives. is, he observed, is the sign of a living church. He also paid tribute to the oldest Methodist pastor present, the Rev T. C. Nga, and thanked and acknowledged all who had contributed towards the smooth running of the Aldersgate Convention 2011. 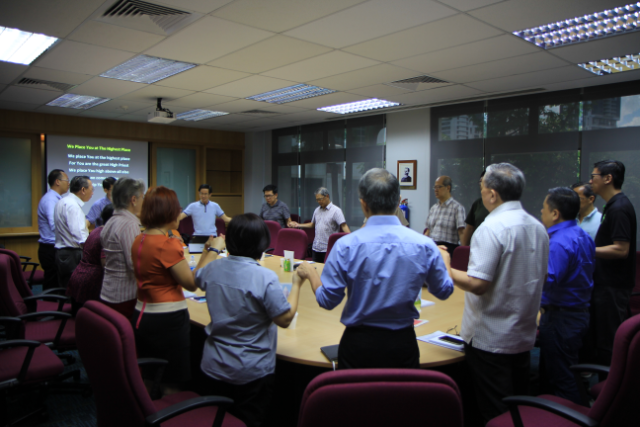 Following that, three pastors who had each served e Methodist Church in Singapore for 25 years received their Long Service Awards: the Rev Koh Keok Nguang, the Rev Joshua Tan Sin Kian (both from the Chinese Annual Conference), and the Rev Dr Norman Wong Cheong Sau (from Trinity Annual Conference). e Bishop gave the Benediction in Mandarin, Tamil and English, and the congregation was sent forth with lively music by the choir and orchestra, to partake of the refreshments provided for all. “O LORD, DO IT AGAIN!” e Rev Dr Eddie Fox envisioned this as the message sent by the gathering of 350 Singaporean Methodists at the Aldersgate Lecture on May 23 – a plea for God’s Holy Spirit to move in revival here among us as He did in the lives of John Wesley and the Methodists 273 years ago. The session began with the singing of various hymns written by the Wesleys – Samuel, John and Charles. Bishop Dr Robert Solomon introduced the Rev Dr Fox who had been an ordained minister for the past 51 years and had begun preaching when he was only 16 years old. The septuagenarian speaker indeed impressed all present with his feisty and emphatic teaching. He began by recounting the story of John Wesley’s experience of spiritual revival at Aldersgate Street on May 24, 1738 – despite his being there “very reluctantly”. The speaker reminded us that it is significant that Methodists do not celebrate John Wesley’s birthday or death-day, but the day of his “heart-warming” experience at Aldersgate. Almost 50 years after his personal revival which sparked a wave of Methodist revival in his society and across the world, John Wesley reflected on the Methodist Movement and concluded that his only fear was they would “exist as a dead sect having the form of religion, but not the power thereof… Unless they hold fast to the Doctrine, Discipline and the [Holy] Spirit with which they first set out.” is, then, the Rev Dr Fox referred to as the Wesleyan way of revival. “The Holy Spirit is the “absolute essential” to a living Movement. 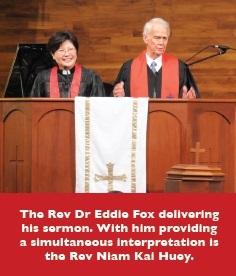 – The Rev Dr Eddie Fox. Committing to “speak plainly for plain people” as Wesley had done and had exhorted us to do, the speaker explained that Doctrine meant “sound teaching”. He emphasised that “it matters what you teach”, and that our central message had to be focused around Jesus, who knows the way to the Father because He came from the Father. Discipline was described as the way we ordered our lives so that we would be faithful to the vision and mission that we have, being an evangelistic, missionary movement committed to spreading scriptural holiness and reforming our continent and church. The Rev Dr Fox led us in singing a song from Sunday School, “Everybody Ought To Know”, and asked if we believed what we sang. He challenged us to then consider what sacrifices we would make and what we would give (possessions, children, ourselves) in order that everyone would know Jesus Christ. Then came the main point on which he expounded the most: the Holy Spirit is the “absolute essential” to a living Movement. Without this, he added, there would be no power, no witnessing, no Christian conversion, and no living Church. Jesus Himself said: “The Spirit of the Lord is upon me, for He has anointed me” when He first began His ministry (Luke 4:18). John Wesley echoed His words when he was led to preach in open air on the streets for the first time. Jesus also promised that we would receive power when the Holy Spirit had come upon us, enabling us to be His witnesses “to the ends of the earth” (Acts 1:8). He closed by leading the congregation to sing the refrain from the hymn “Revive Us Again”, as a prayer to the Lord for revival in The Methodist Church in Singapore. The floor was then opened for congregants to submit questions for him to answer, and they came thick and fast. Some of the questions touched on issues like reassurance of salvation, the diﬀerence between missions and evangelism, living an evangelistic lifestyle, keeping the flame of revival going in the church, and gifts like speaking in tongues. The Rev Dr Fox gave pithy replies, emphasising again the role of the Holy Spirit in giving assurance from God who always keeps His promise, in keeping the flame alive such that our only role is to stay close and be warmed by the flame of revival, and in deciding what gifts to distribute and for how long. He also pointed out that this being God’s world, there is no such thing as “foreign missions” but we should fully proclaim the Gospel in every land, including ours. He likened the false dichotomy between “speaking” and “doing” evangelism to the connection between breathing in and breathing out – both are necessary, he said, adding that often, listening opens the door to speaking, and encouraged us to pray for God to help us listen. The service closed with mutual words of thanks from the Rev Dr Fox and the Bishop, followed by the Benediction. Thereafter, the speaker was approached by congregants to autograph the last available copies of his co-authored books that had been on sale outside the sanctuary.